When Aston martin unveiled their AM310 supercar concept at Villa d'Este, everyone knew that it would become the company's next flagship. Now Motor Authority has leaked the production version and it's not quite as super as you might have imagined. The upcoming Vanquish, set to debut tomorrow and go on sale later in the year, is built on the same VH platform that we first saw nearly a decade ago on the DB9. 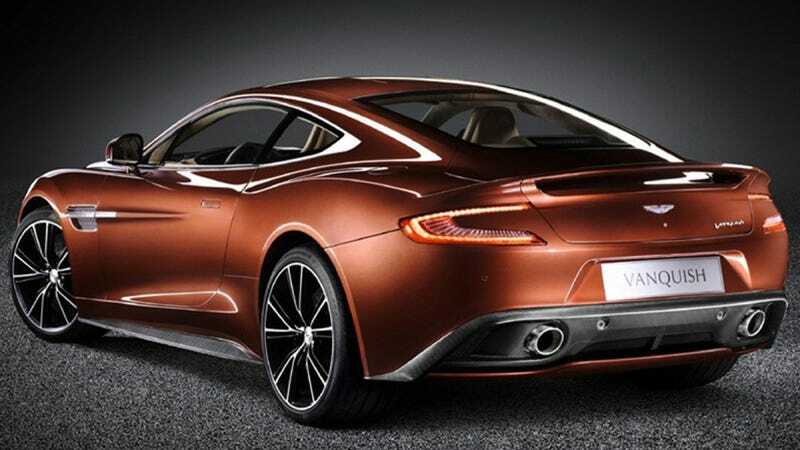 The Vanquish's engine is a 6.0 liter V12, likely a further refinement of their current motor. While Aston calls these features next-generation designs, they are nothing groundbreaking in their field. Where the Vanquish really loses out is in the numbers game. Top speed is estimated at 183 mph and 0-60 is expected at 4.1 seconds. That's hardly quicker than a base 911 Carrera S.
Where the Aston may make a name for itself is as the consummate grand tourer. Fuel economy is up, there's more space in the trunk, handling should be amazing (the structure is 25% more rigid than before), and the interior is gorgeous even in these pixilated press pics. Motor Authority anticipates a price tag of £189,995, or about $298,520. In spite its carbon-fiber body and super fine interior, that's still a lot to pay for a car that will have trouble outrunning the baddies in the next Bond flick.